Fig. 1 - Ink that bled due to capillary action. 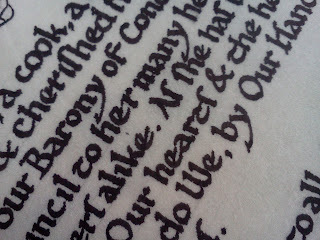 During a collaborative scribal project we made the unfortunate discovery that not all writing inks are created equal. Why this had never occurred to me before is something of a mystery, especially since I had bought, experimented and discarded a number of modern inks before finding my preferred iron-gall ink. Thankfully our mini-disaster turned into a great learning experience. Writing ink is essentially a coloured water which incorporates a glue so that it sticks to the page. Traditionally these inks were made from either a carbon-black pigment or from iron salts (ferrous sulfate) mixed with the tannin from gall nuts. The binder (glue) was usually gum arabic which also acted as a thickener. Most modern inks are created to effortlessly flow through a pen which requires them to be much "thinner" in nature. Therein lies the problem. Just as inks are different, so to are writing surfaces and they also need to be taken into consideration when paired with a writing ink. Parchment is not paper and vice-versa. Even among papers, some are more absorbent than others. In our seed example (fig.1) we experienced the perfect meeting of an ink that is too thin being used on a ground, in this case goat parchment. 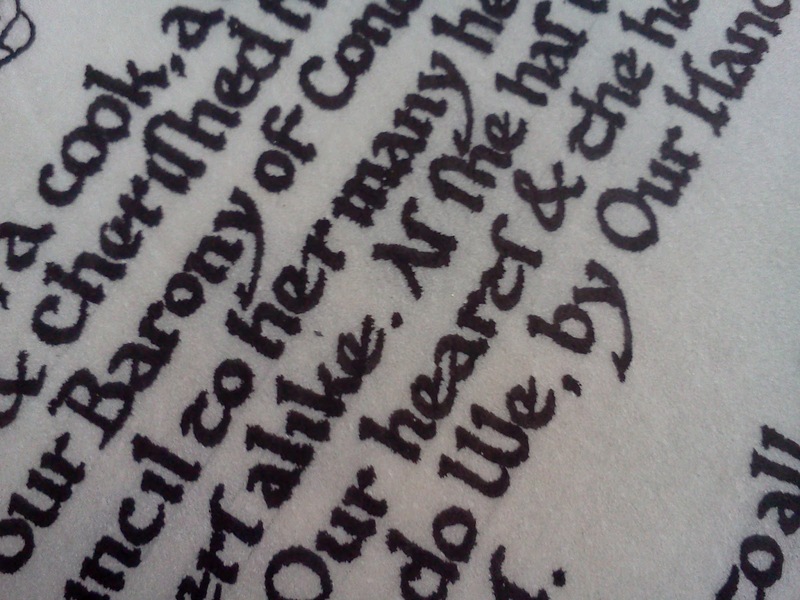 You can see in the image how all of the letters are "fuzzy" when they should be crisp and clean, this is due to capillary action dragging the thin ink along the hairs of the parchment. Had the ink been more viscous it would have sat on top of the fibers and created the crisp sharp lines we expect. As an on-going experiment I will be testing different inks with the various grounds I use during my scribal work. I intend to try thickening and thinning the various inks to see how this affects their behavior on the different grounds. I will update this post with my findings.